I have been slowing down with publishing posts this month for reasons mostly beyond my control but entirely of my choosing. Turns out that in life there are at times things that take priority over spending hours sitting in front of a computer writing about one's favorite taqueria in some forgotten corner of Denver. September has been on of those months for me, though I can now see some light at the end of the dark and long tunnel of my responsibilities. Tonight I fortuitously received an email from a friend in Chicago who knows me and my weaknesses all too well (see this post on Denver's Table 6 for more details). I thought it would be fun to share the picture that was embedded in the email of some take-out place near my friend's house. It is one of those pictures that should make you at least smile this Friday-- either that or be insanely jealous that your favorite take-out doesn't offer fried chicken skins for the price of a gum-ball. If I were a more prolific writer, I'm sure I could find the analogy between these tasty-looking chicken skins, the jar they dwell in and my hectic life right now. I can't, but I wish they each represented a responsibility of mine, as then they would have been taken care of long ago, and all I would be left with is that familiar aching belly and smug sense of satisfaction. That is amazing. Chicken skin in a jar?? 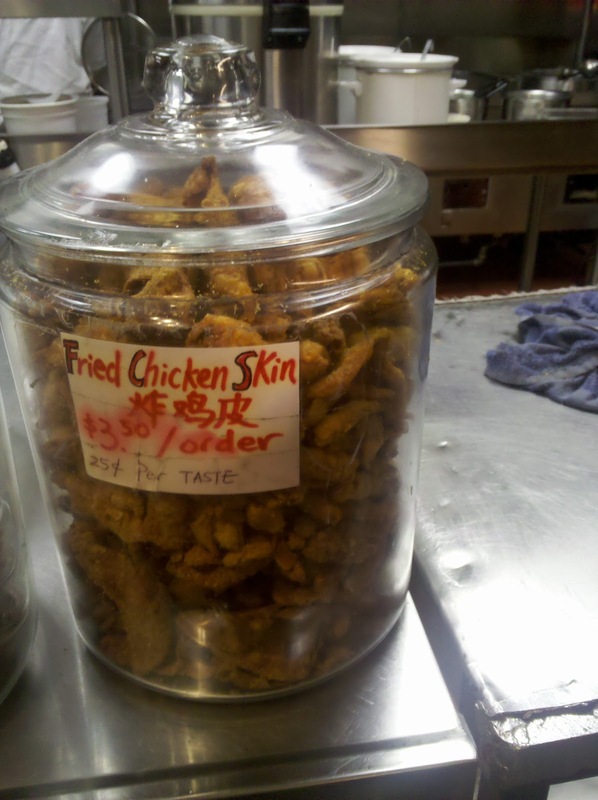 Who needs chicken meat, when you have fried chicken skin? Awesome. I may bring a roll of quarters to this place if I make it there.